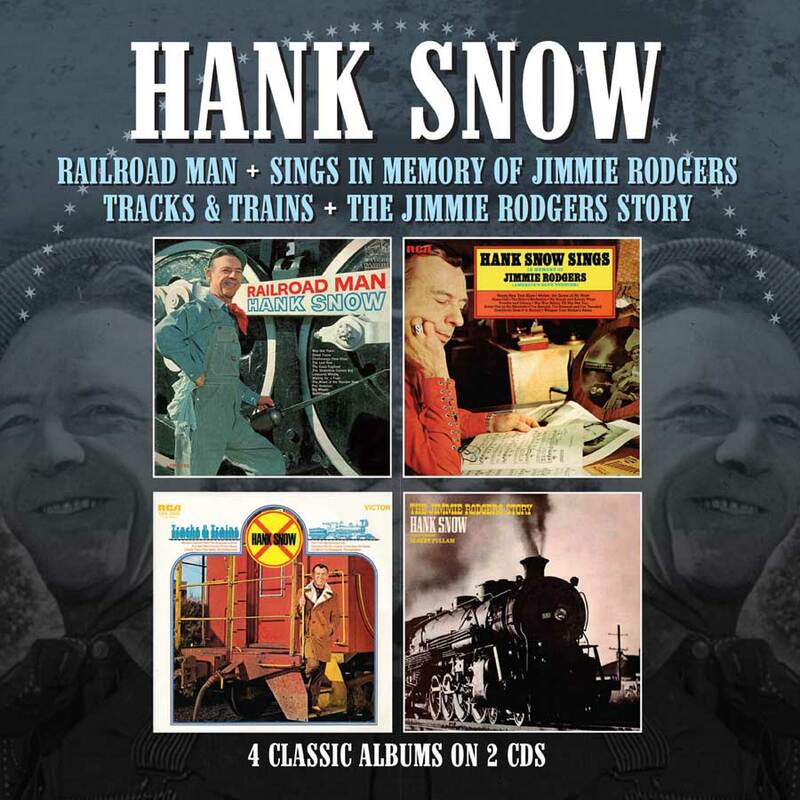 Four albums brought together for this double CD release present Hank Snow at his traditional best, covering titles from the Jimmie Rodgers songbook and tales of railroads and trains, both subjects dear to the singer’s heart. Hank Snow was one of Country Music’s grand masters. Along with legends such as Roy Acuff, Ernest Tubb and Eddy Arnold, he was one of the big post-war stars of Country Music. Hank’s background was different from almost all other country singers having been born Clarence Eugene Snow in Brooklyn, Nova Scotia, Canada on May, 9th 1914. Although Hank Snow commenced his recording career in 1936 in Montreal, Canada (debuting on RCA Victor’s Bluebird Label), it was when he moved from RCA Canada to the label’s American parent company in 1949 that his career really took off, scoring 85 Billboard chart hits between 1950 and 1980. The four albums brought together for this double CD release present Hank Snow at his traditional best, covering titles from the Jimmie Rodgers songbook and tales of railroads and trains, both subjects dear to the singer’s heart. “Hank Snow Sings In Memory Of Jimmie Rodgers” (1970) and “The Jimmie Rodgers Story” (1972) clearly show that the singer never lost the love for his idol’s music. The second album added even greater authenticity as Albert Fullam, a one-time locomotive engineer who had met Rodgers, mixes biographical details with personal reminiscences in a narration that precedes most of the tracks. It was probably Rodgers’ persona as the “Singing Brakeman” and songs like ‘Waiting For A Train’, that were an inspiration for Snow’s contributions to the genre. “Railroad Man” (1963) and “Tracks & Trains” (1971) highlighted the fact that train songs always had links with traditional country music and these two albums collected songs that stretched over the decades. Inducted into the Country Music Hall of Fame in 1979 and with over 825 recordings to his credit, Hank Snow was forced by ill health into retirement in his final years. 16. WHY DID YOU GIVE ME YOUR LOVE?